I love it when squash blossoms start popping back up at my local farmers’ markets. Typically found in the Los Angeles area in the late spring, these edible flowers are a special and versatile ingredient that are only available for a very short time before they disappear until the next season. 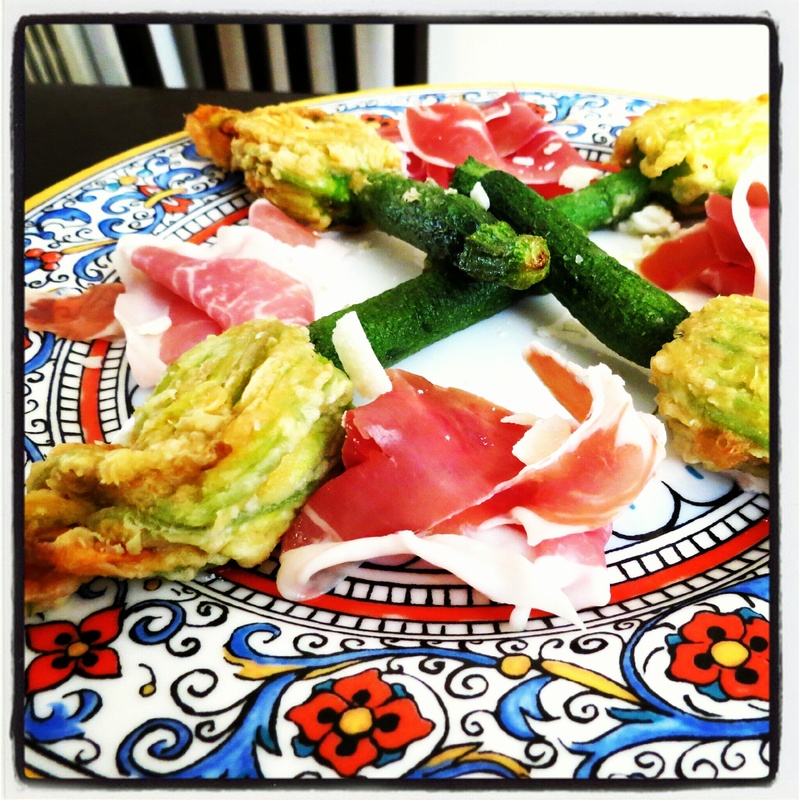 You will often find squash blossoms at high-end restaurants ( Osteria Mozza and Jar included), but what many people don’t know is that these beautiful blossoms are very inexpensive. The Hollywood Farmers’ Market has them for about $4.50 a pound and our handful of 10 flowers only cost $1.50. Not too shabby for a popular gourmet ingredient. There are so many different things you can do with squash blossoms but one of the most popular ways you’ll see them prepared is stuffed, battered, and fried. I am particularly fond of making stuffed squash blossoms as a light appetizer served with prosciutto or as part of a cheese plate. I try to get younger blossoms with a longer stem, but these blossoms with baby zucchini attach work just as well and make for a lovely presentation. 1. Carefully clean each blossom by slowly opening the blossom and pulling out the stamen and any seeds inside. Quickly dip them in a bowl of cold water or mist them with a spray bottle if you have one. Gently pat dry with a paper towel. 2. Mix together ricotta, goat cheese, and chopped herbs in a bowl until combined. Season with salt and pepper. If you have a pastry bag, place mixture inside and get ready to stuff. If you don’t have one, a small zip-lock bag works just as well. Just cut a triangle off the corner (not too big) for the same effect. 3. Prepare your stuffing station by having a shallow bowl of flour ready next to a bowl of egg. 4. Pre-heat a deep frying pan with about an inch or two of oil (I like to use sunflower or a light neutral oil in a heavy-bottom cast iron skillet). 5. Trying not to open the blossom too much, begin stuffing your flowers making sure not to over-stuff. Over-stuffing can cause the petals to tear. 6. Submerge the blossom in egg then quickly dredge them in flour making sure to shake off any excess flour. 7. Fry each blossom over a medium-high heat making sure to carefully turn them until they are crisp and golden brown all over. Place on a plate with paper towels to drain. 8. Top with some grated parmesean or asiago and serve immediately.